A risk assessment tool has been developed so that licensees can better understand the EPA's risk assessment process. An important part of preparing for the risk assessment process for licensees is to consider the environmental risks of their current operations. All licensees are encouraged to use this tool for their premises so that they can understand the environmental risks that may impact on the risk rating for their premises. Identification of environmental risks allows consideration of environmental improvements that could be put in place to address and reduce the risk level of a premise. 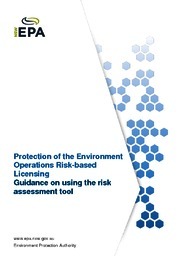 Risk assessment tool user guide (PDF 1.3MB). The risk assessment tool user guide should be referred to when using the risk assessment tool to ensure that the tool is applied accurately and consistently. If you have any questions regarding the risk assessment tool or results, please contact your local EPA regional office, or phone Environment Line on 131 555. The risk assessment tool and its results are for the user's information only. Results generated when using the risk assessment tool are not recorded or reported back to the EPA. Formal risk assessments will always be undertaken by an EPA officer in consultation with the licensee.